The clean energy and green infrastructure sector are growing rapidly in the nine-county Bay Area. The regional workforce dynamics compel a Bay-Area-wide approach to preparing the workforce and connecting them with projects. There is growing demand for established clean energy projects like solar PV and solar thermal installation, and increasingly for emerging work on energy storage (battery), and electric vehicles (charging station) installation and maintenance. It is critical to ramp up the skills of small contractors to access clean energy projects and to tailor and deliver curriculum to them. Emerald Cities Collaborative is a national nonprofit committed to helping small minority-, woman- and veteran-owned contractors and disadvantaged workers build careers in the energy efficiency, renewables and green building sectors. Additionally, Emerald San Francisco works with government, business, labor and community stakeholders to build demand for energy efficiency, renewable energy, and clean building projects and then connect small minority-, woman- and veteran-owned contractors and disadvantaged workers to these opportunities through programs like our highly successful E-Contractor Academy. 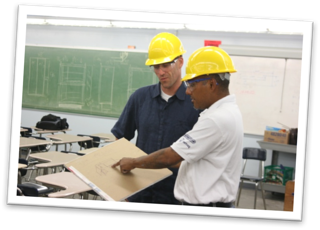 The San Francisco Bay Area E-Contractor Academy is made possible through generous support of the Federal Home Loan Bank’s AHEAD program and the SFPUC’s Contractors Assistance Center. The E-Contractor Academy is a workshop-based technical and business skill-building program that trains small, minority and disadvantaged contractors from low and moderate income communities to successfully bid and secure public and private contracts for renewable project construction and services coupled with energy efficiency building retrofits, distributed energy storage, and public works/utility projects. So if your small minority-, woman- or veteran-owned business does construction and services related to energy efficiency, renewables and/or green building projects, E-Contractor Academy can help you grow your business.